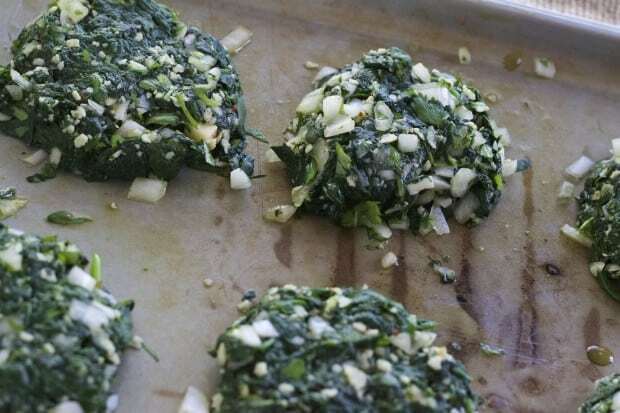 These vegetarian spinach patties with salsa verde are one of my favorite ways to eat spinach. Covered with rich green tomatillo sauce, each fork-tender little green cake hides pinky finger-sized chunks of melty sharp cheese. The first time Carmen made her tortas de espinaca for me, I flipped out, they were mindblowingly good. Carmen is my Mexican hostess, cook, sister and friend, my Mexican home-stay mother at Spanish language immersion school. She is also a teacher, and when you stay at her house, you speak only Spanish. Even if you just speak beginner Spanish. It’s a goal of my life to speak Spanish well. The best thing I’ve done to that end was travel to Mexico, to language immersion school. 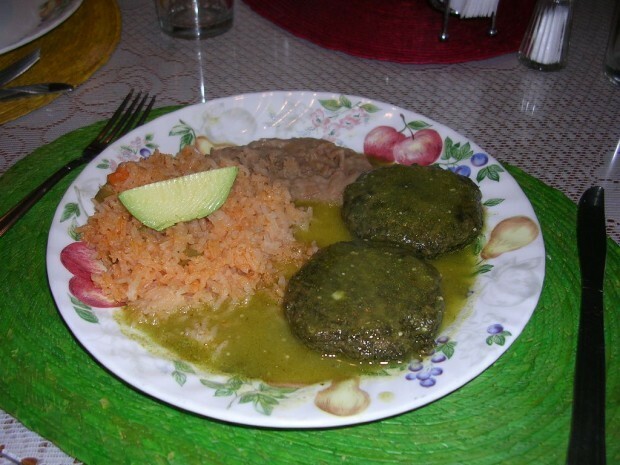 Tortas de espinaca Carmen, or spinach patties with salsa verde, is one Spanish lesson I’ll remember, and that I’m happy as a margarita to pass on to you. The salsa verde Carmen ladles over tortas de espinaca, this recipe, is unique in that there’s no cilantro, which I always put in tomatillo sauce. 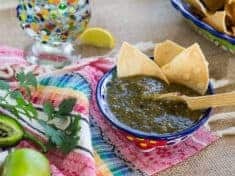 I even called Carmen in Mexico to confirm that her salsa verde doesn’t include cilantro. Sí, no. Cilantro goes in the tortas but not in the sauce. Carmen’s original recipe includes bread crumbs, to absorb moisture and help the patties hold together. I told her I was going to replace ground corn tortillas so the patties could be gluten-free. She said “no hay problema”, and that flour or cornmeal are also fine substitutes for the bread crumbs. 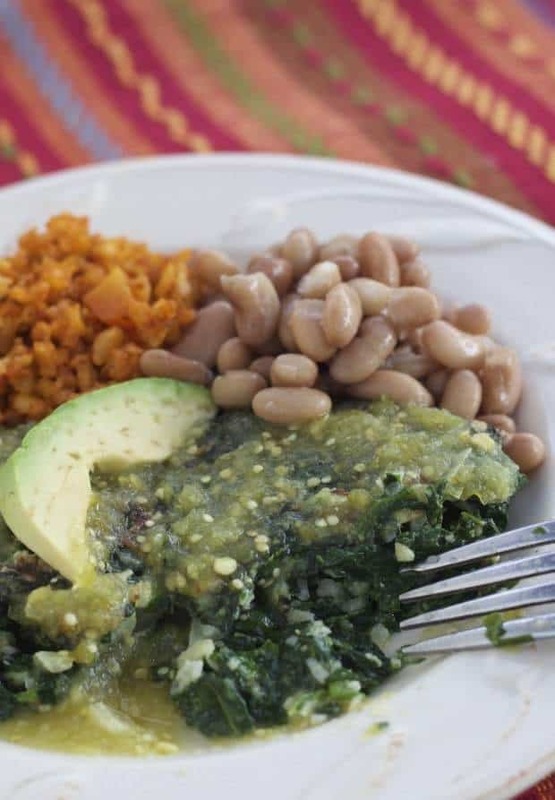 Like Carmen’s, I serve my tortas de espinaca come with Mexican rice and tender pinto beans. My last visit with Carmen, she sent me home on the plane with para llevar, a couple tortilla roll-ups of leftover spinach patties. Wrapped in the roll-ups were slices of avocado, tomato, and queso Oaxaca, a melty cheese similar to mozzarella. I am pretty sure the person next to me on the flight was envious. He got peanuts. 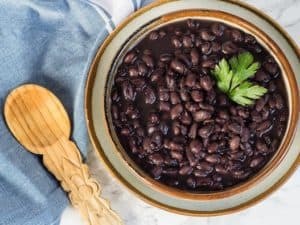 This recipe is a blog post from years ago, written right after a two-week stint at Cuernavaca Language School, and home-stay at Carmen’s; I’ve updated the post with new photos. See an old photo of Carmen’s tortas de espinaca on her floral-pattern melamine plate below the recipe. 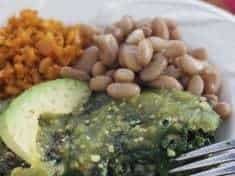 You might also like my green enchiladas with spinach and arugula. Spinach tortas, spinach patties, tortas de espinaca--call them what you like. You can make them with fresh or frozen spinach--see recipe. 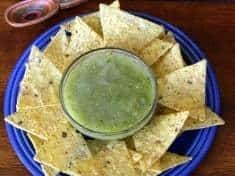 With easy tomatillo green sauce! Recipe can easily be doubled. Makes about 6 patties. Serve 2 tortas per person. ** Fresh spinach: Wash well and remove and discard stems. Steam the spinach leaves about 5 minutes. Allow to drain in a colander or sieve, pressing very well to remove as much excess water as possible. Coarsely chop the spinach. 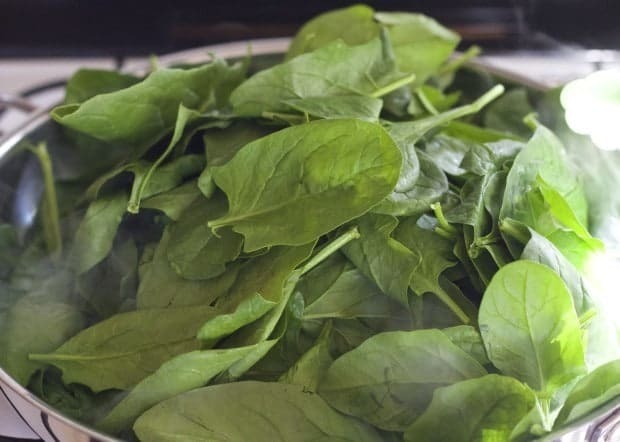 ** Frozen spinach: Thaw the spinach. Put in a sieve and press very well to remove as much excess water as possible. In a bowl, mix with the chopped onion, garlic and cilantro. Using a fork, stir in the eggs, salt and pepper. Stir in the corn tortilla meal or breadcrumbs, just enough so that the mixture holds together. Over medium flame, heat a thin layer of the oil in a large skillet. Gently cook the patties, turning to cook both sides, about 3 minutes per side. Remove from the heat and keep warm while you prepare the sauce. Drop the fresh tomatillos into boiling water and cook for several minutes, mostly to remove the paper-like skin. 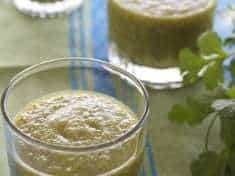 Place the tomatillos, serrano chile(s), onion and garlic and salt in a blender and whirl. Heat a small amount of olive oil in another skillet and add the tomatillo mixture. Cook and stir for 3 or 4 minutes. Stir in vegetable broth, just enough to thin the sauce. Season to taste with salt. Pour on top of the spinach tortas and over medium heat, cook them together a few minutes. I substituted ground corn tortillas in place of breadcrumbs, which Carmen uses to absorb moisture and help hold the patties together. 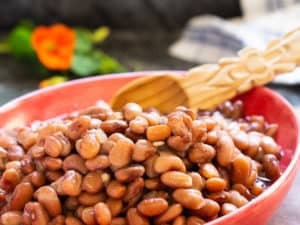 You could also use a little cornmeal, or flour.